Home › Environment › Ireland in 2050 – How will we be living? Ireland in 2050 – How will we be living? More than a year ago I read an interesting article in the Irish Times about life in Ireland in 2050, move on a year and I heard an interview with this same guy who had now written a book on the subject. It was about this time that I hesitantly joined twitter and within a short time I was well aware of who Stephen Kinsella was. Christmas was coming up and I put down ‘Ireland in 2050‘ as present option, and on Christmas morning it duly arrived. Since then it has sat on the shelf while I read ‘Earnest Hemingway’s “For whom the bell tolls’, and Anthony Beevor’s ‘The battle for Spain’. Recently I finally got down to reading “Ireland in 2050” my interest in the book was not in what type of gadgets we would be using by then, but how as a society Ireland would develop. After reading ‘The battle for Spain’ is was almost uplifting!. Please bear with me while I try and give you a brief account of my own personal interest in the subject of Stephen’s book . I live in Lucan a suburb less than 10km from the Dublin’s city centre. We moved in here in 1995 with no family connections with the area. Over the following years I struck up good friendship with neighbours and got involved in local groups. Lucan in 1970’s had been a sleepy village of about 7,000 people by the time we moved in that figure had risen to 22,000. Today the population of the greater Lucan area is 43,000 that’s roughly the size of Waterford City. That’s quite a transformation in 40 years and has completely changed how Lucan has developed as a community. As new housing developments sprung all around Lucan, the delivery of social infrastructure such as schools, playgrounds and public transport did not keep pace with housing. and for most new residents there is no real connection to Lucan in the sense of community. Sporting organisations and schools by in large have been the thread with has bound these estates to Lucan together. I joined many local organisations and have campaigned for reform in planning which would see development in tandem with amenities and services. In 2001 the government’s decision to designate Adamstown (a development of 25,000 inhabitants) the first Strategic Development Zone (SDZ) in the country, (i.e. fast-tracked development without normal appeals to An Bord Pleanála) set alarms bells ringing in Lucan. Our schools were creaking at the seams, public transport was very poor, the re-opening of Lucan train station had been talked of for years, and because of this Lucan had become gridlock because the car had become the only means of getting to work and schools. As proposals were going through planning the entire community was alarmed that there still was no commitments by the relevant agencies that schools, buses, trains, playground, or green areas playing parks would be delivered in tandem with housing. On top of this Lucan had suffered severe flooding in November of 2000, primarily poor planning decisions had made it possible to build new developments on floodplains. New families moving into their new homes their home would be in danger in times of flooding . Hundreds on new home, and business were flooded to a depth of one metre. Move on three and a half years I had established a voluntary group called The Finnstown input Group, to raise our concerns on the poor planning decisions that were been taken and the lack of infrastructure attached. After many meetings with developers, Politicians and an extensive national media campaign and finally An Bord Pleanála, we had become experts in planning, environmental studies and transport modelling. We got commitments for most of our concerns and housing was developed in a phased basis with the delivery of social infrastructure/amenities attached to each phase. Today due to the down turn development has slowed considerable but Adamstown is not a ghost estate the design and layout is good and we have 3 purpose built schools, playground, a train station and a bus service. This did not occur because it was the right thing to do it only happened because a group of like minded people got together to ensure we got a development that worked for all that lived there. Had it been left to local and National Government, to ensure it was delivered right, they would have failed us yet again. Now living there myself the one thing we lack is a real sense of community, and I was very interested to see if Stephens book would give any insight how life suburbia might develop over the next 40 years. 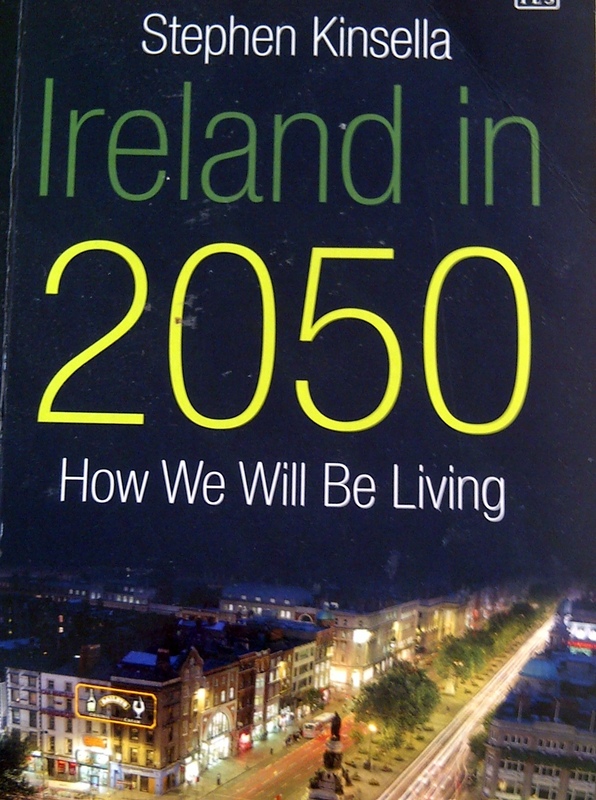 In the opening chapter Stephens says ‘Ireland in 2050’ will face serious threats to our nation from climate change, inequality, energy security, and an ageing population. But the balance of our social and economic lives is not that fragile, as a nation we can accommodate changes of breathtaking scale. In the past we have weathered worse in the history of our nation. Population: of Ireland in 2050 is projected to be up to 7 million – people born today can expect to live in to their nineties, one in four of us will be over 65 by then. Health: As people live longer pension age will creep up. With a population of 7 million stress will be placed on the current health system, the private-public mix of patients will have to be abandoned. Work: The idea of having a job for life will have a evaporated with careers lasting 60 years or more. People will have multiple careers interspersed by periods of retraining. Building an innovation economy means starting many enterprises that simply don’t work. Climate: We can expect drier summers with water shortage been a problem along the east coast and milder wetter winters. This will have major impacts on flooding will become an issue – a once in a century event will become a once in a decade event. Energy: Ireland needs to embrace nuclear energy in the medium until renewable energy can meet the demands. Security of energy sources is a strategic imperative for Ireland, without cheap power the economy will wither. Education: We don’t teach children to how deal with uncertainty, complexity or how to be creative. The education system as it stands embeds fear of not having the right answer to the question or the showing the correct steps to get a solution. In real live there are no right answers and we don’t always know the correct steps to get the solution either. Poverty: A policy directed towards increasing community connections between middle class and poverty stricken areas would help alleviate wide spread isolation. Local Government and community: leadership at local government is required in order to avoid short term planning pressures, to discourage encroachment from national executives and to provide for education to broaden the public’s higher urban densities and better quality design. The fact that local authorities are not engaged in health, education and policing reduces the stake that people feel they have in local government. Research shows that on average in suburban life most know some where between six to ten people, and less that a third are involved in a voluntary group. The ‘Youth Bulge’: in the medium term, three problems present themselves; access to services, job creation and societal integration. Social media: It is already playing a big role in my life, a few years ago it would have been difficulty for me to get information like this out. I never dreamed I would have a blog, be on facebook or twitter they have given us all easier access to people and information, that would have been hard to imagine just a few years ago. Stephen’s book is very informative and given my own experience of life in 2010 suburban Lucan I can see gaps appearing in our community that were once bridged by local voluntary groups. In the future there needs to be radically changes at local government in how in interacts with resident within these communities. This must be debated now if we are to avoid a real disenfranchisement between local governance and society. “Ireland in 2050” is a very enjoyable read and it’s not filled with graphs or statistics, and I would highly recommend this book to all. You can also visit Stephen Kinsella’s blog. ‹ Dublin Bus route changes are welcome, but can they deliver? Great post, can’t wait to read Stephen’s book myself! I applaud you on the work done as you arrived and grew into the local community. I too moved to a small community & became involved in local community activities for seven years. When the development boom started I raised my concerns over the speed & impact but my concerns were completely dismissed & sadly I left it to it’s own devices. You wouldn’t recognise the place now. In my new location (6 years there now) – even more rural, I again tried to raise concerns of insane rapid development. The reaction was, ‘what can we get out of it’. Having been invited to contribute by a local Councillor who then turned out to be in that same camp, my frustration forced me to abandon involvement. I used my own funding to try and object & appeal to planning in an effort to at least slow the development, but all failed. Of course things have changed now, fortunately (in some respects) the collapse happened before another 6 hundred houses were started, so the damage is not too bad, and I don’t get such bad looks anymore from the local farmers who didn’t get to pocket the mils !! Hi Inshin, Thanks for your comments, bullet points are areas covered in Stephen’s book that I felt had a direct bearing on my own personal situation. The book is fascinating and we should be begin to discuss issues now. Just looking at both aftershock programmes on RTE over past 2 nights, it quite clear there was no strategy or bigger picture. There was plenty of money to ensure we had sustainable development, but that money was wasted or misplaced. I would like to think we will learn valuable lessons from the current catastrophe and put legislation in place that no only protects us from another banking crisis and housing bubble, but ensures that Ireland develops as a inclusive society. I recommend everyone reads Stephen’s book, if you have an interest in your kids future, we must act now.